In addition to Bob Klein’s dedication to affordable housing, a cause to which he’s been committed for more than three decades, Bob is also committed to advancing medical research. This commitment originated when his younger son Jordan was diagnosed with Juvenile Diabetes in 2001. A year later, his mother was diagnosed with Alzheimer’s. In 2002, Bob Klein was a principal negotiator on a Juvenile Diabetes Research Foundation team that worked successfully to pass a $1.5 billion mandatory federal funding bill for an additional five years of Type 1 and Type 2 diabetes supplemental National Institutes of Health research funding. Bob Klein served as author of Proposition 71 and as Chairman of the California Proposition 71 committee, the champion sponsor of the California Stem Cell Research and Cures’ $3 billion ballot initiative, passed in November of 2004 by 59% of the California voters (7 million votes in favor). This initiative supports research with a focus on pluripotent and progenitor stem cell research. Proposition 71 bans funding for human reproductive cloning. The purpose of The California Stem Cell Research and Cures Initiative is to realize the promise of stem cell research and provide treatments or cures for diseases and injuries that affect millions of Californians. The initiative supports all stages of the research, from basic research, to clinical trials, to patient treatment, in an effort to cure chronic diseases. By focusing exclusively on research institutions and entities within California, the initiative creates projects and jobs that will generate new tax revenues for our state. Klein Financial Corporation is proud to support community and national organizations such as L.A.’s non-profit Entertainment Industry Foundation’s (EIF) charitable program Stand Up To Cancer (SU2C). 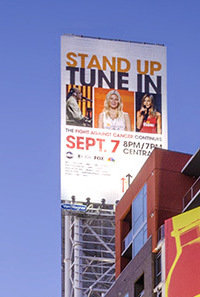 Klein Financial donated the highest billboard space at 1600 Vine to help promote the telethon fundraising event that aired on September 7, 2012 on ABC, CBS, FOX, NBC, E!, VH1, Style Network, Smithsonian Channel, Ion Television, TBS, Encore, Starz, HBO, Showtime, HBO Latino, Bio., MLB Network, LMN, Mun2, Palladia and Logo. Stand Up To Cancer was aired and viewed in 170 countries. Bob Klein was awarded the 2010 Biotech Humanitarian Award for his work in setting up and running CIRM. Until June 23, 2011, Bob Klein served as the Chairman of the Governing Board of the California Institute of Regenerative Medicine (CIRM), the agency established by Proposition 71 to manage and distribute the $3 billion in stem cell research funding. He was elected Chairman Emeritus on that date. Bob Klein has also served on the Board of Genome Canada, a nonprofit research funding agency established by the Canadian federal and provincial governments with $1.8 billion in resources; this agency was originally focused on genomics research, principally in the medical field.